Sober Look: US dollar a safe-haven currency? You bet. US dollar a safe-haven currency? You bet. 1. 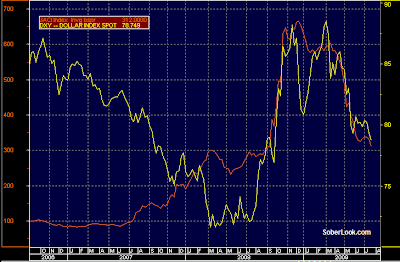 As we discussed earlier, the low US borrowing rates make the dollar a perfect carry trade currency to short. That means any increase in volatility will push investors into unwinding the carry trade by buying back the dollars they've been short. 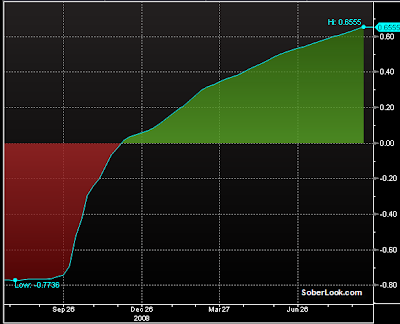 When risk aversion recedes, investors put the carry trade back on by shorting the dollar. 2. Switzerland is no longer considered a safe haven due to it's exposure to the banking sector (significantly larger as a fraction of the GDP than that of the US) and increased transparency with regard to depositor accounts (reducing the amount of deposits at Swiss banks.) Therefore the Swiss Franc is no longer as attractive of a place to park investors' cash. 3. The US has a deep short-term government bond market, making it easy to park dollars and maintain tremendous liquidity if need be. 4. Currencies that have exposure to commodities are considered a leveraged bet on the global economic recovery. These include the Australian and the Canadian dollars and are expected to benefit from strong commodity prices. The same applies to many emerging market nations, who will benefit from any recovery much faster than the developed nations. 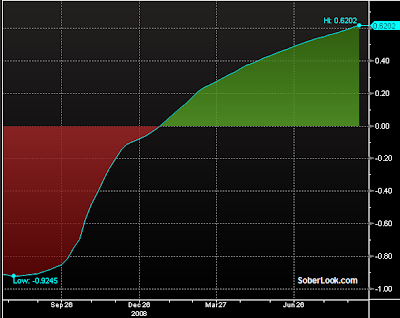 Any threat to the speed of the recovery sends investors running back to USD and Yen. 5. The Yen, the other safe-haven currency, is a bit more of a problem (relatively) these days because Japan's deep recession and government debt levels far beyond other OECD countries makes investors uneasy. It's still one of the top choices, but has given ground to the dollar as the boring place to park cash. 6. Gold is another such currency, but it lacks the liquidity of the dollar, which is so critical in this environment. The data actually supports the "dollar safe-haven" hypothesis. As a safe-haven currency, one would expect the dollar to rise at times of high risk aversion and fall in periods of increasing confidence in the global recovery story. We compare the dollar over the past year with the VIX index and the JPMorgan composite investment grade corporate bond spread. Both should act as indicators of risk aversion. Here is the chart of the dollar value against a basket of six major currencies (labeled "DXY" in the charts), versus the VIX index. 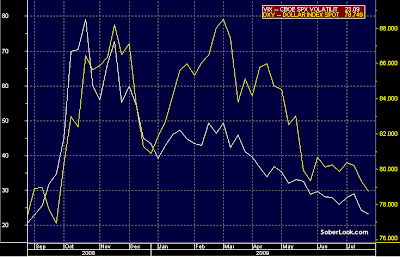 Below is the historical correlation chart of the dollar value versus the investment grade spread. Positive correlation shows flight to dollar during periods of widening spreads and the correlation has been positive and stable recently. There is no question that recently (since the fall of 08) the dollar has become the equivalent of a money market fund in the universe of currency investment choices. It's a temporary place to park your money to wait for each mini-storm to blow over, before putting the money back to work.